This Cobb Salad Dip is the perfect appetizer for parties, events, and get-togethers. 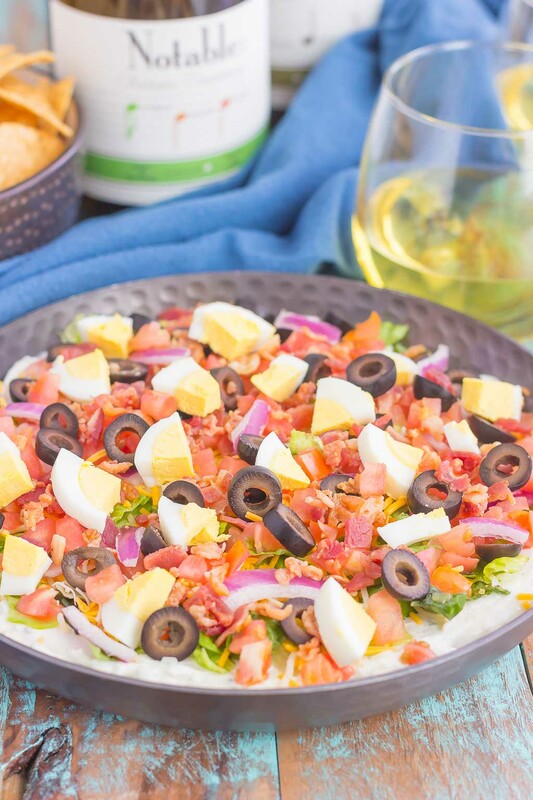 A zesty ranch dip is loaded with the classic flavors of a Cobb salad and is sure to impress even the pickiest of eaters! I feel like it’s the calm before the storm. You know what I’m talking about…the calm before the craze of holiday shopping, decorating, cooking, baking, parties, presents, and so much more. But, a good storm! After all, this time of year is my is my favorite and I try to indulge in everything it has to offer. But, before the holiday in December comes Thanksgiving, and that is a favorite of mine, too! Of course for the food, but also because it’s the official start of the holiday season. And don’t even get me started on how early holiday movies have been airing on TV! I will admit that I’m a sucker for those cheesy, lovey-dovey TV movies that air on Lifetime and the Hallmark channel. But, when Hallmark started airing the movies 24/7 at the end of October, it was just the teeniest bit too early…even for me! Though I will admit I started watching those movies already…don’t judge me, ok? Since the holidays are approaching, I’ve been dreaming up some delicious recipes that would be perfect to indulge in, along with a bottle (or two) of wine. Since it’s almost time for those holiday parties, I’m in desperate need of some easy appetizer ideas! 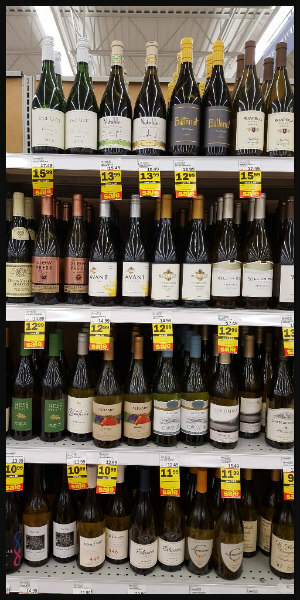 When I was at the grocery store a few weeks ago, I stumbled across Notable Wines. It’s the first wine that highlights the flavor profiles on the front of the bottle, helping to make the wine aisle a less confusing place. Notable Wines vary in style, region, and taste, yet most wine labels don’t describe what you’re about to sip. So when a wine showcases the tastes right on the front label, it’s setting you up for success, leading you to the wine you want to taste. All you have to do is follow the flavor notes! How nice does that sound? I can’t decide which flavors of Notable Wines I like better, as both are elegant and delicious. The “Oaky and Buttery” Chardonnay or the “Fruity and Crisp” Chardonnay each has their own, unique taste. If you want to learn more about Notable Wines, head to this website. You can also follow Notable Wines on Facebook and Instagram. 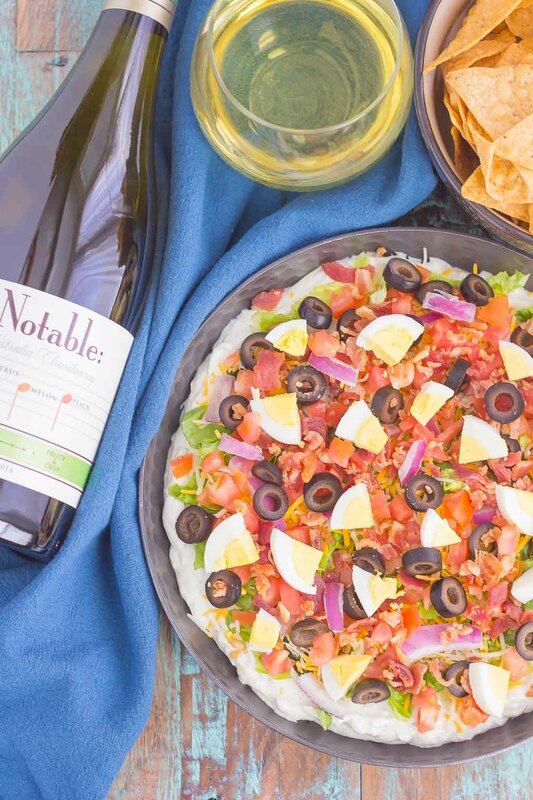 After stocking up on several bottles of Notable Wines, I headed home to whip this easy Cobb Salad Dip that would pair perfectly with a glass of wine at an upcoming holiday event. If you’re like me, your holiday schedule is filling up quickly, and easy bites are needed for those get-togethers! This Cobb Salad Dip is a favorite of mine. Not only is it easy to make, but it’s so delicious and tastes just like a Cobb salad, but in dippable form. 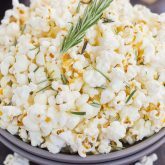 Pair it with crackers or tortilla chips, along with a glass of Notable Wine, and your holidays are set to be looking bright. I did mention this dip is easy to make, right? You know me…I’m all about the easy recipes, and this loaded appetizer couldn’t get any easier to prepare. To start, you’ll combine some softened cream cheese and sour cream together with a packet of dry Ranch dressing mix. Spread it onto the bottom of a pie plate or pan, and that’s the base of this easy dip. Then comes the fun part…the toppings! 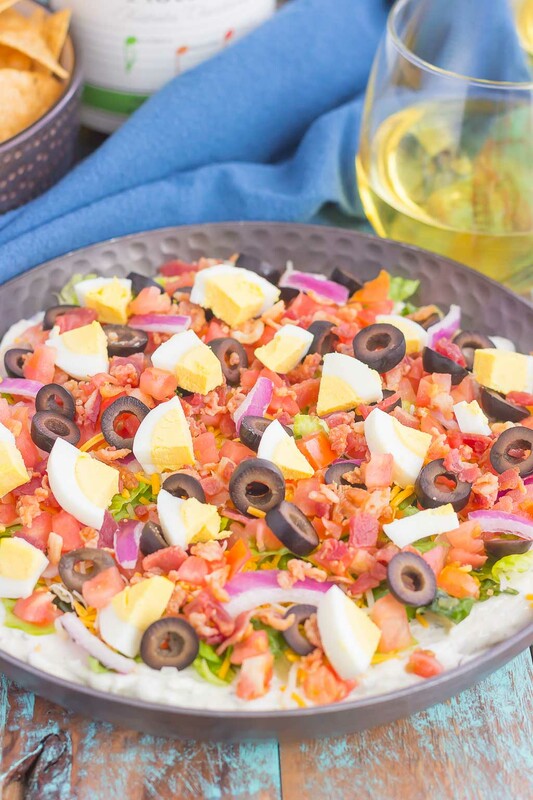 Since this is a cobb salad dip, I loaded it with romaine lettuce, shredded cheddar cheese, bacon bits, diced tomatoes, black olives, red onion, and a chopped, hard boiled egg. Feel free to dress up or down the dip, depending on your preferences. And that’s it! Easy peasy and oh-so delicious. So if you’re looking for that perfect party appetizer for the upcoming season, grab those ingredients and a bottle of Notable Wines, and your party guests are sure to be wowed! Looking for more easy appetizer ideas? I’ve got you covered! In a medium bowl, stir cream cheese, sour cream, and Ranch dressing mix until well combined. 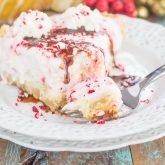 Spread onto the bottom of a pie plate or regular plate. Top with lettuce, cheddar cheese, red onion, tomato, bacon bits, olives, and egg. Serve immediately with crackers or corn chips, if desired, or refrigerate until ready to serve. Like what you see? Then be sure to head to your nearest retailer to find their selection of Notable Wines! Time sure is flying by! Thanks for the sweet comment, Dawn! I'm a sucker for those cheesy holiday movies too, Gayle!!! I'm also a huge fan of Cobb salad, and this dip is Brilliant!! I could definitely eat an entire plate of this to myself!! All the yum! Pinned! Cheers! This is SUCH a gorgeous dip and so creative too! I love anything and everything cobb salad so this is right up my alley! I'd eat this straight from the pan with a spoon! No shame in eating with a spoon! :) Thanks, Sarah! I'm always on the lookout for new dip ideas, especially around the holidays! This is a fun one! The calm before the storm is right...I just want to push pause and stay in this moment for a month or more! 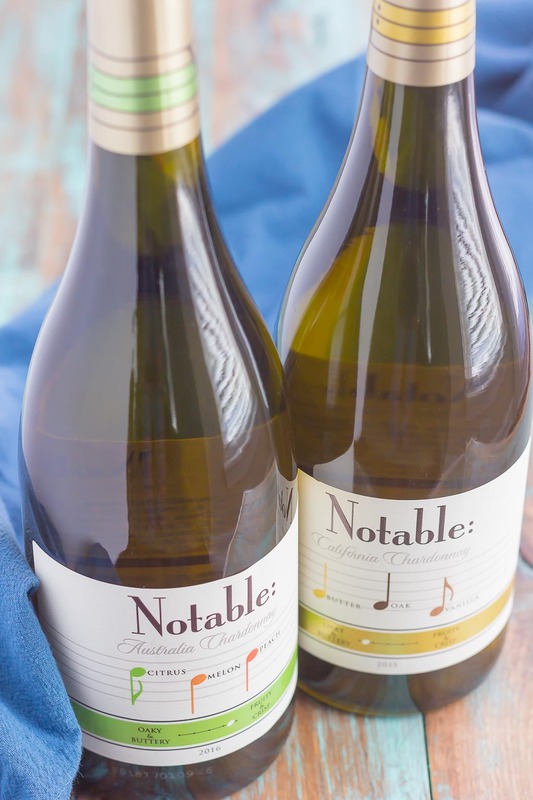 I've never tried Notable wines...I will have to check them out! I love cobb salad and this is such a creative dip for the holidays! 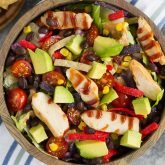 I love that you get all of the flavors of cobb salad in one delicious bite! I can't wait for that storm! But it feels weird that it is already November :) This dip looks perfect! So creative ! Love it! Thank you, Dawn! The black olives are my favorite, too! Awesome! What a fun idea! I've eaten a million dips in my lifetime but I've never heard of Cobb Salad Dip. 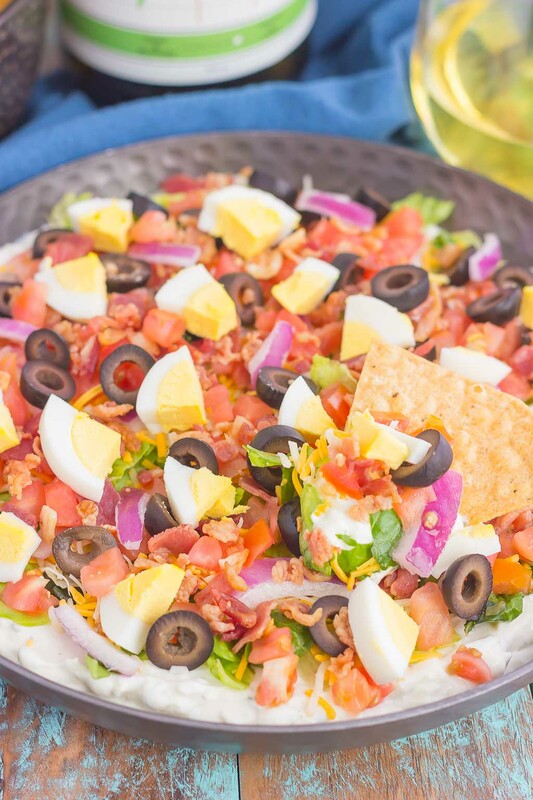 Cobb Salad is my favorite all-time salad so I can't wait to make this the next time we host a football party (or just a party in general). What's the old saying? There's always room for Cobb Salad Dip! Ha, just kidding, but for reals tho, this looks amazeballs. 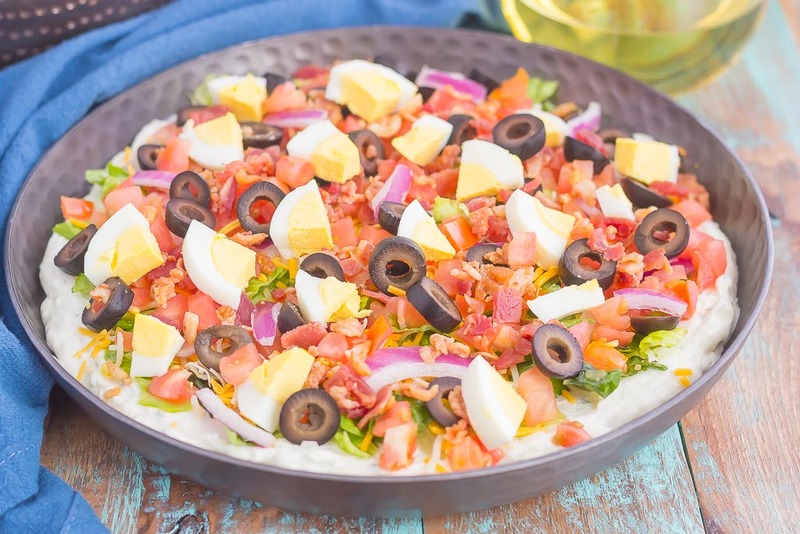 Cobb salad dip is a must-try! Thanks for the sweet comment! Oh my goodness...so many layers of flavor! You can never go wrong when there's bacon involved! :) Love your twist on a fun holiday dip. Sounds delicious! This is so clever. And so delicious! 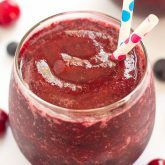 Very appetizing game day (or really, any day) recipe! Love your creative take on cobb salad as a dip! I've totally been hooked on the hallmark movies already! Once I start watching I just can't stop. What a creative dip, Gayle! I love cobb salads, so I know I'd just love this dip. Perfect holiday snack! Aren't Hallmark movies addicting? Thanks, Keri! sounds very delicious! I love trying new dip recipes! haha yup I totally hear you! We had a wedding this past weekend out of town and now that we're back I feel like it's holiday holiday holiday mode!!! This dip is just too fun! We've started to get invites for holiday parties and I definitely needs ideas for what to bring! It's definitely starting to get hectic! :) Thanks, Ashley! What a terrific idea...everyone likes a Cobb salad. Love that you turned it into a dip. I think I would add some chopped Avocado right before serving it. Thanks, Karen! Avocado sounds like a great addition!